Home - The Chequers is a classic 15th Century Pub & Restaurant located in Goldhanger near Maldon in Essex. Please note: There will be no food served on Sunday April 28th. The Chequers is located in the charming village of Goldhanger on the River Blackwater in Essex. This 14th century inn retains many of its original features in its several rooms whilst combining modern and traditional food with the kind of friendly and attentive service one expects. The Chequers is an award winning inn serving several real ales and wines by the glass as well as a range of drinks one would expect. With real fires in the cold and a sunny patio when warmer it is the perfect place to relax or socialise which ever suits. The Chequers is the ideal setting off point for a number of walks along the Blackwater Estuary and surrounding area. It is also popular with bird watchers who enjoy the tranquility and beautiful surroundings of the Blackwater to follow their passion. All are made welcome here at The Chequers to quench their thirst and have a bite to eat. Next door to the pub is St Peter's Church. The north side of the church is Norman, 11th century, and the south side is 14th century when the aisle was added. There is evidence of much re-used Roman brick. 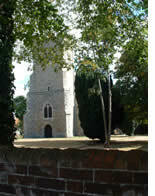 The tower was added in the 15th century. Dominic, Philip and their staff welcome one and all to The Chequers for a meal, a drink,a coffee or just to say hello in this most traditional of pubs. Monday to Saturday. 11am - 11pm.